This BYU illustration grad has covered nearly every inch of her home in art. “No surface is safe,” says Lynde Madsen Mott (BFA ’97). Indeed, in the Mott family home it is hard to find a wall, floor, window, or countertop that doesn’t bear the illustration grad’s artistic touch. And outside the Pleasant Grove, Utah, home, their camper trailer, ’68 VW bus, and even the chicken coop all have received the Mott makeover. In the videos below, drag the image to maneuver your view around rooms of the Mott home. In the first video, Lynde Mott will be your guide. In the others, it’s a self-guided tour. Press pause if you’d like to explore a room a little longer. • Unable to afford Persian rugs, early Saints would paint colorful imitations on old sailing linens and tack them to the floor. Mott followed their lead but painted directly on the floorboards. • The Nauvoo Room also features an authentic, 175-year-old Gorman bench, also called a bishop’s bench, “because bishops hosted a lot of people,” says Mott. The bench—like an early futon—folds out into an extra bed. • Much of the stained glass in the kitchen and throughout Mott’s home was created by Provo’s Gomm Stained Glass, done on trade for her painting work. • Mott fell in love with magnolias—the flower painted onto the library floor—when living in Louisiana as a child. “When they’re in bloom and fragrant, they just make you swoon,” she says. • To give her Queen Esther a look at once elegant and humble, Mott painted a crown of flowers in her hair. “Not a gaudy, worldly, bejeweled crown, but a natural crown, the lotus blossom,” she says. • Mott’s studio is both a place for painting and a painted work itself, from the stenciled floors to enormous flowers and bees on the walls. • The work on the easel is a self-portrait of sorts, a bird’s-eye view of herself and her sisters arranging flowers. • Here as in other rooms, Mott extensively utilizes decoupage—or glued-on collages of ephemera preserved under a transparent finish. • When designing a room for her son, she took inspiration from a Christmas card he had found. • Mott intended the bed posts, adorned with branches and sugar-pine cones, to echo the aspens on the walls. • Mott says she didn’t have to purchase any of the paint for her garage—neighbors just drop off leftover paint from their projects, figuring that she’ll have a use for it. • Labeled with the Mott-family motto “Rejoice Evermore,” their ’68 VW bus has been exhaustively decorated inside and out. Mott says she was going for a shabby-chic with her decoupage in the bus’s interior design. 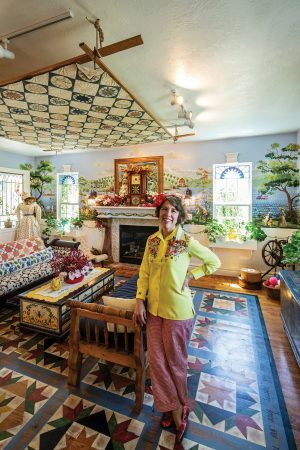 • Mott says she drew inspiration from the masters while decorating this upstairs room. The angels she borrowed from Raphael, and she felt a little like Michelangelo as she stood on a scaffold to paint stars on the vaulted ceiling. • This room features the Mott household’s single solitary closet (where she keeps historical costuming for models). When they built the home, Mott opted to leave closets out of the rooms, so as to open up rooms more. The family keeps clothing and other items in armoires and dressers instead. • Mott’s panoramic seaside scene is based on, and extends out of, the framed print that hangs on the wall above the toilet.